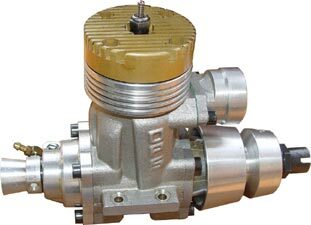 Tom Clement and Jimmy Jones collaborated on the production of a pair of 15cc motors in the 1960s, which we have referred to previously. 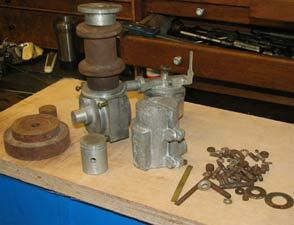 Tom took his apart with the intention of rebuilding it to a more modern specification. As happens all too frequently, following his death, his workshop was cleared and parts of the motor went two different ways. Luckily the history of the motor was known, so with a bit of negotiation, all the parts were recovered and the motor rebuilt. 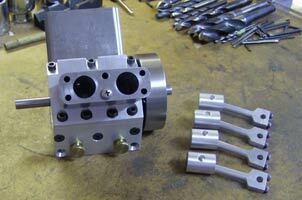 The only alteration was a new venturi and mounting as the original had been machined off. In there somewhere is (most of) a Gerald Smith 15cc Magpie. 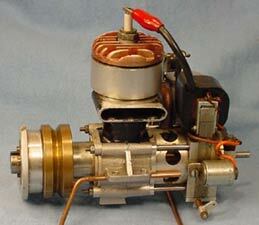 Around 35 of these motors were built between 1946 and 49. Available in four versions, this one has the serial number 297. The odd appearance is probably due to a very bad landing that wrecked the motor. 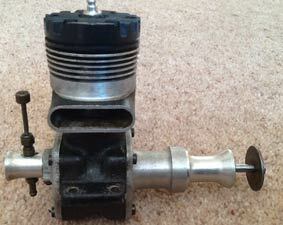 Someone has quite skilfully cast a completely new front crankcase half to take the original contact breaker assembly. The fabricated engines mounts and absence of the advance/retard mechanism would indicate that these all perished in the accident as well. Difficult to be sure, but the crankshaft is probably new as well and has a separate contact breaker cam inside the front housing, most complex. 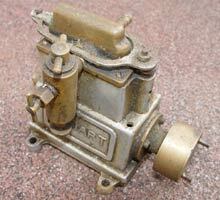 The carburettor is also a combination of new and original parts, but it does have the original 'Magpie' engine plate. 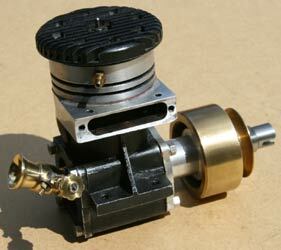 This very well made 15cc hydro motor had received unwelcome attention to convert it to RC and water cooling. The fins can be replaced but the suspicion is that the polished transfer passage has erased details of the original builder, can anyone help please? 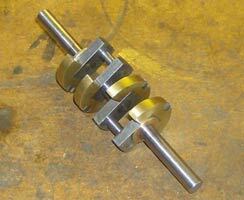 There is a possibility that it was a prototype for a well known manufacturer. Arthur Weaver turned his attention from hydroplanes and tethered cars to rail racing, primarily with the North London Club. 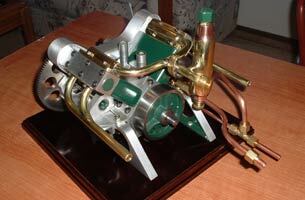 He built several cars and numerous engines, and along with fellow club member Bill Ransom produced the design and serialised the construction of the 'Weaver Ransom' 1cc motor. 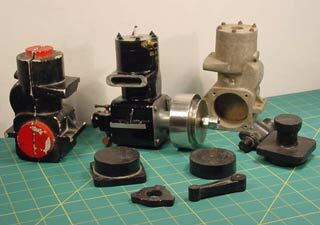 Here we see sideport, shaft valve and rear rotary valve versions. Three of the motors with clutches are for spur mounting while the larger one in the foreground is for a bevel drive car. 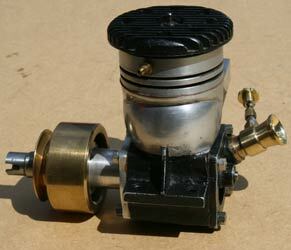 This and all the other engines in the series are black and carry the name of Vincent motor cycle models. It was discovered through a small ad in the now departed Aviation Modeller. The other versions went elsewhere, including one to Miguel de Rancougne (Black Knight) but the owner of this one also had all the patterns and the half finished example, which he passed on as part of the deal. The name of the builder is now but a distant memory but these 30cc water cooled lumps are an impressive relic of his work. 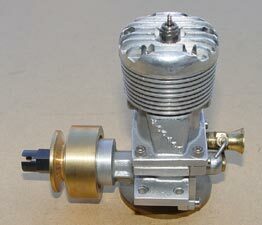 This 15cc, sideport two-stroke motor was described in the magazine of that name in 1939 by W. Cooper of the King's Lynn Club. 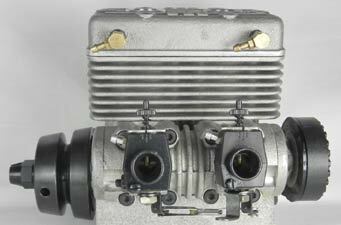 Very different to the EM 30 that preceded it and a strange construction with a two piece jacket clamped round the cast iron cylinder which had transfer, inlet and exhaust ports machined into it. Until the arrival of the McCoy and Dooling motors, the American Hornet powered untold tethered cars and hydros through to the end of the 1940s. 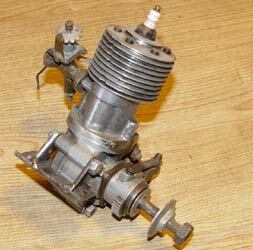 This was probably the first of the successful modern racing engines. The 5 port OPS superseded the 3 port 'Redhead' and became the standard motor in cars and hydros from the 1980s until Picco's own P 60 and EXR overtook it in performance. Out of production for many years, Mantua are now producing it in the standard RRV and this the drum valve version. This was the 2nd version of North Downs Engineering's attempt to break the stranglehold of the American racing motors. Unfortunately it could never match performance of these. OTW published the complete Nordec story in 2012. 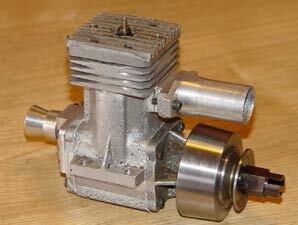 When compared to the Stuart below, this V4 motor is at the other end of the scale. Motors of this configuration have been built by numerous people over the years, but this is certainly one of the more complex. 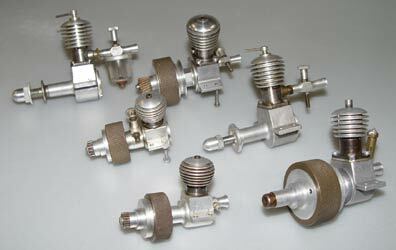 The only element not readily visible is the overhead valve gear on each bank of cylinders. A fine piece of engineering. 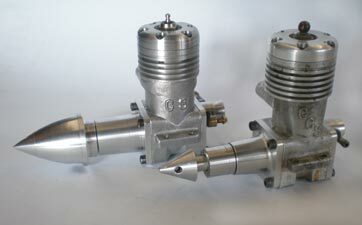 The smallest and lightest of the Stuart Turner twins is cast from aluminium unlike its larger brothers. This motor was available with either a shuttle valve or conventional slide valve and formed the basis of many hydro and other steam plants. 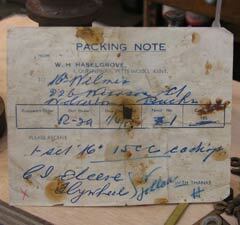 It had a relatively short production life from around 1926 until 1939 when ST became preoccupied with war production. Stuarts did manufacture many thousands of small generating sets during the war, including steam powered versions that utilised a similar high speed twin motor. Both the generating sets and the Star motor are now sought after and command high prices.